This Wednesday evening I will join Fr. 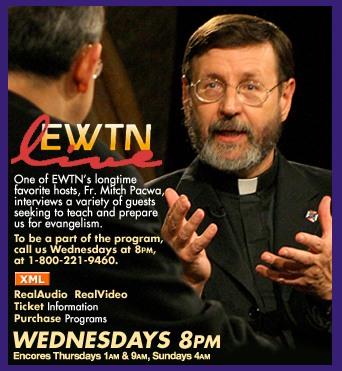 Mitch Pacwa on EWTN Live at 8 PM Eastern time. We will discuss the new launch of our Footprints of God DVD series on EWTN starting September 1. We will talk about the Bible, travel in biblical lands, the story of salvation and lots more. I have interviewed Fr. Mitch for my series and now he will interview me.